There’s nothing quite like a newly remodeled kitchen. From the beautiful new cabinetry to the new lighting fixtures, a kitchen remodel will breathe new life into your home. As we noted in a previous blog post, a kitchen remodel is also one of the best investments you can make in your home. Many residents in Newburgh and the surrounding areas are installing granite countertops in their kitchen remodels, and in today’s post, we’ll explain why you should, too. Affordable Granite & Cabinetry Outlet is Newburgh’s Top Rated Local® remodeling company. We provide luxury remodeling services for bathrooms, kitchens, and other areas of the home. Our kitchen design experts can help you transform your current space into the functional and beautiful kitchen you’ve always wanted, so get in touch with us today or come by our showroom at 179 South Plank Road to request an estimate! 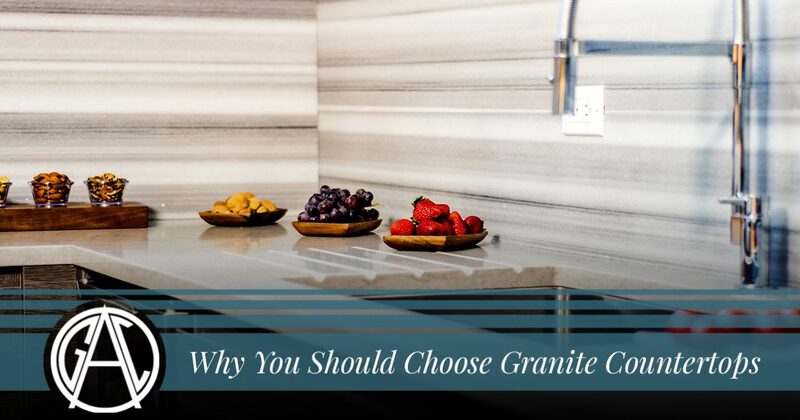 Continue reading below to learn more about why you should choose granite countertops. 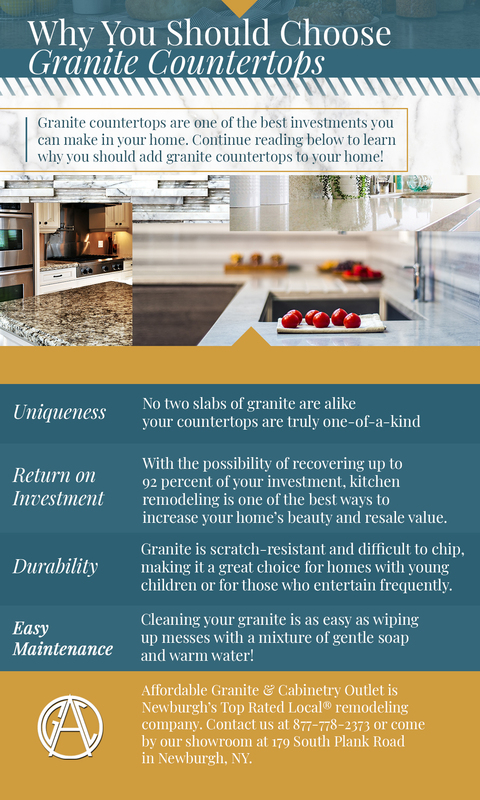 While granite countertops have many functional benefits that will be explained below, many homeowners choose to install granite countertops for their beauty and uniqueness. Granite is an igneous rock, meaning that it was formed through the process of magma crystallization under the earth’s surface. Granite slabs contain other minerals such as quartz, feldspar, and mica, all of which create unique and beautiful patterns. Some slabs of granite will contain more of these minerals than others, and generally speaking, this feature is a function of how quickly the magma cooled. Magma that cooled slowly will have larger mineral deposits and more crystallization, while magma that cooled quickly will have fewer minerals. No two slabs of granite are alike, meaning that the granite countertops you purchase are entirely unique to your kitchen! As we noted in a previous blog post, a kitchen remodel is one of the best ways to improve your home’s beauty while also increasing its resale value. While we recommend that you read the entire post, the main takeaway is that kitchen remodeling can be seriously lucrative — in fact, you can recover up to 92 percent of your investment with the right design. We can help you choose granite countertops and custom cabinets that will stay in vogue for the next several years, allowing you to make a smart investment in your home. Granite is certainly beautiful, but it’s also incredibly sturdy. Many homeowners spend a great deal of time in the kitchen each day, making it important to have materials that last. Granite is scratch-resistant and difficult to chip, making it a great choice for homes with young children or for those who entertain frequently. It’s important to have your granite sealed and polished at least once each year to protect the surface, and doing so will keep your countertops looking new for years to come. Suppose you’re cooking with a cast iron pan and accidentally set it down with too much force, causing a small chip. In the event that your granite is damaged by a drop or a scratch, don’t panic! Granite can be repaired with a specialty putty, and it can also be buffed and repaired in nearly every case. One of the biggest benefits of granite is that it’s easy to maintain. As long as your granite has a strong seal, you’ll just need to clean the surface with warm soap and water to maintain its shine. Clean up spills immediately, and be careful whenever you’re dealing with acidic substances like citrus juice or coffee. We’ve explained more about caring for granite countertops in a previous blog post, so be sure to read through it to find a wealth of helpful information! We hope that this post will inspire you to install beautiful new granite countertops in your home. If you’re thinking about a kitchen remodel in Newburgh, then get in touch with one of the kitchen design experts from Affordable Granite & Cabinetry Outlet for assistance! We’ll listen to your needs and help you develop a kitchen design that is as functional as it is beautiful. From custom cabinets to granite countertops that match the aesthetic tones of the rest of your home, we’re here to help you create the kitchen of your dreams. We look forward to working with you soon!